After a series of successful sea and failure mode effect analysis trials, SEACOR Maya was issued its Interim Class Certificate from the American Bureau of Shipping (ABS) with additional notation BATTERY-Li, the first ever ABS OSV to have this notation. SEACOR Maya is currently operated by Mantenimiento Express Maritimo, S.A.P.I. de C.V. (MexMar), SEACOR Marine’s joint venture in Mexico. SEACOR Marine contracted with ABS in March 2018 to class SEACOR Maya as the first OSV in the Gulf of Mexico to operate using hybrid power. 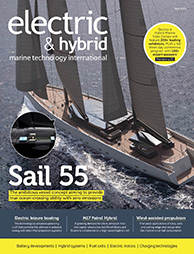 Following the vessel’s successful modification to hybrid lithium battery power propulsion, ABS provided the additional BATTERY-Li notation for the SEACOR Maya in May 2018. SEACOR Marine conducted the upgrade project on SEACOR Maya at Bollinger Shipyards in Morgan City, Louisiana, USA. Sea trials of the vessel were conducted in mid-May 2018. Corvus Energy supplied the lithium-ion-based Orca energy storage systems for all four vessels in the Gulf of Mexico, while Kongsberg designed the supply and integration of the hybrid power into the vessel’s control, power monitoring, and dynamic positioning systems. Both Corvus and Kongsberg are contracted for the remaining three vessels operated by MexMar as well.